Club Member Daniel Martinez wanted to work with the best. Unfortunately I was busy, so he turned to Ryan Neil. Seriously, Ryan Neil is considered one of the hottest young American bonsai artists. 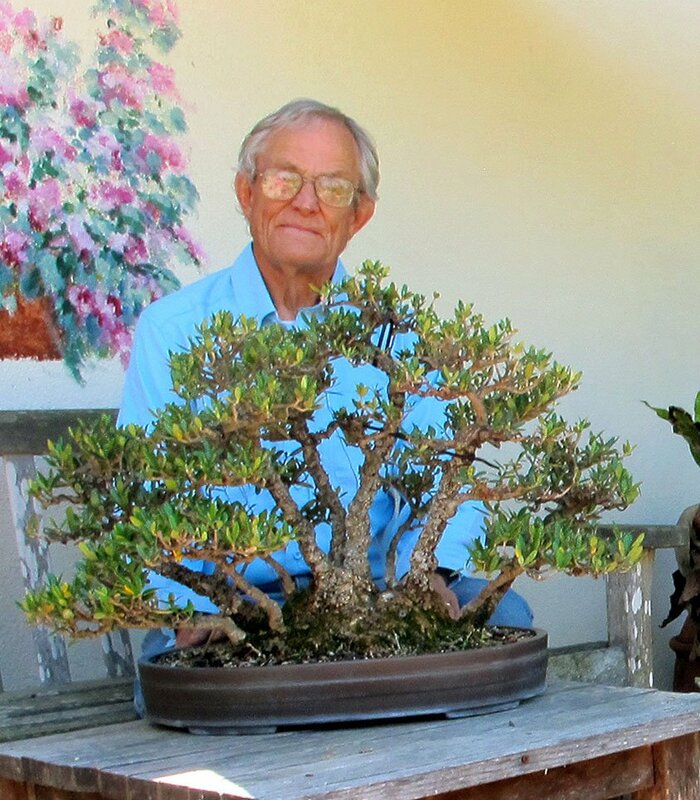 He grew up in Colorado and first discovered bonsai at a county fair. He interned for the first time at age 12. He and his dad used to collect specimens from the Rocky Mountains. 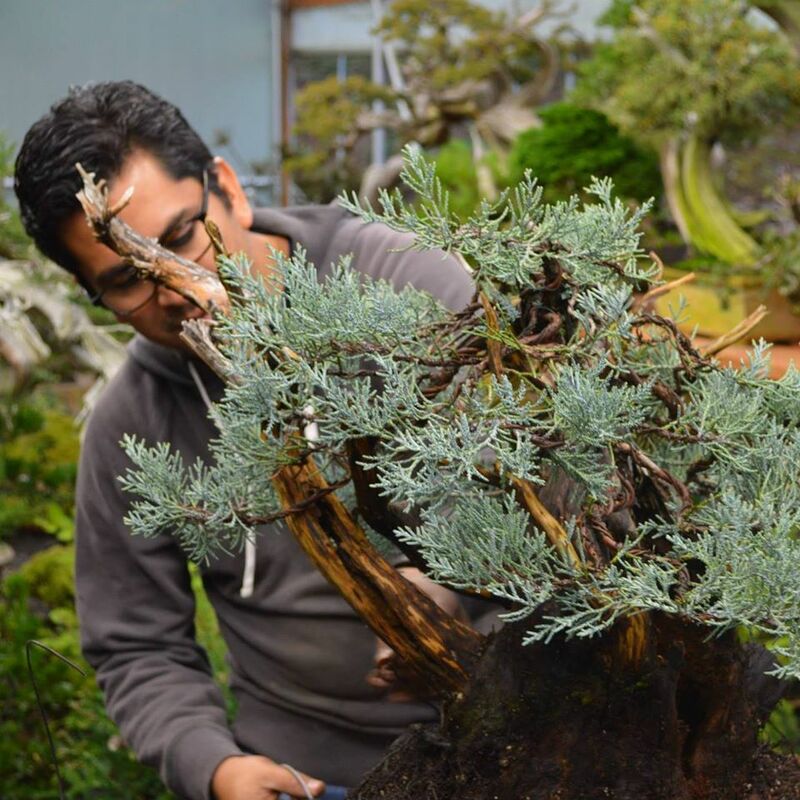 He studied horticulture at Cal Poly San Luis Obispo, then apprenticed under the legendary Masahiko Kimura in Japan. He opened Bonsai Mirai in Oregon in 2010, where he uses locally collected materials and turns them into works of art that he sells for thousands of dollars. Daniel worked with Ryan in 2014 in Oregon and he reported on his adventures at our September 2015 meeting. At the September 12th meeting, Daniel will discuss and demonstrate Ryan’s technique for wiring trees. Many Thanks to Tom and Abby Treloggen for hosting our annual summer potluck and raffle at their delightful California Craftsman Bungalow. (Being a British car enthusiast, I especially liked Tom’s old Morris Minor.) Everyone who attended had an enjoyable time and ate lots of tasty food brought in by our members. The raffle enriched the club’s bank account by the grand sum of $154, which on reflection seems a bit low considering the quality of many of the donated items. For example, I ended up with a very promising yew which was certainly worth much more that the $10 I invested in tickets. Ann Erb was seen putting ticket after ticket into the big Japanese book that Wally Kunimoto donated. It was won by her husband John Kopp, so I guess she got her money’s worth. Speaking of Wally, he’s retiring from the job of Workshop Chair which he has done so well. Do we have any volunteers? Years ago I took a magazine journalism class through Santa Barbara City College and the instructor told us to NEVER, EVER end your articles with “And a good time was had by all.” But he didn’t say anything about starting with the phrase. And it’s a fitting phrase for a day at Tom and Abby Treloggen’s beautiful home. After many years in Burbank, where they both worked for Warner Brothers Studios — Tom worked his way up from the mailroom to become a television producer, Abby was music editor on many movies, including one of my all-time favorites: Office Space — they bought their current home and have been working on it every since, adding a new wing and gorgeous Japanese rock garden. As well as drinks, and a tour of their artistic home, Tom even supplied some plants for our raffle. I donated a small juniper and won a huge jade plant that weighed a ton. I felt bad making my wife carry it to the car (kidding). The food was great, the camaraderie even better “and a good time was…” Here are a few photos from the day. Remaining Fall Workshops – $30 Each! – Sign Up Now! 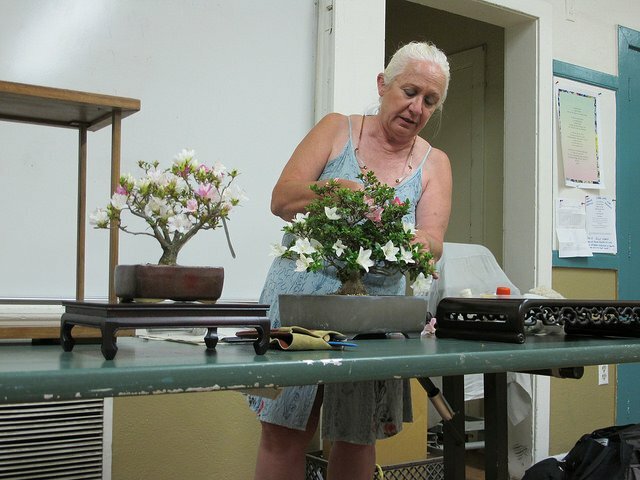 Midori Bonsai Club: 56th Annual Bonsai Show at the Quinlan Community Center, 10185 N. Stelling Road, from 10 AM – 5 PM with a bonsai demonstration by Juan Cruz at 1:30 PM. The demonstration tree will be raffled off at the end of the demonstration. 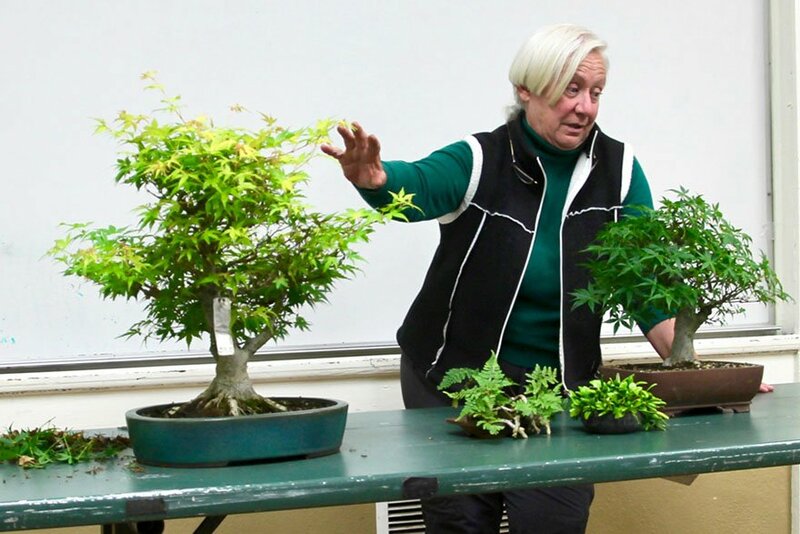 There will be a Beginners Workshop for those new to bonsai at 10 AM for a nominal fee. A tree will be provided along with basic instruction. 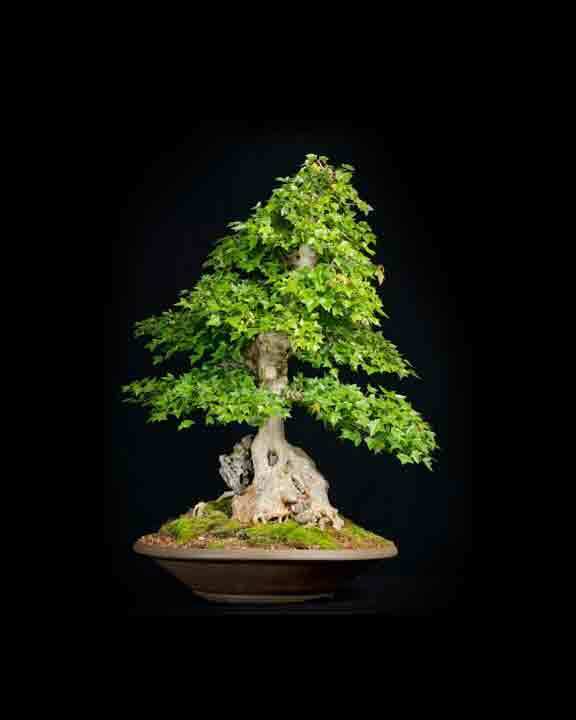 Members will be available to take a look, and advise you, on any bonsai you’d like to bring in. There will be several bonsai vendors to supply you with plant material, tools, pots, etc, and a club member’s plant sale. Admission is free with plenty of parking available. Once again we have been asked to participate in another fun, cultural event in Santa Barbara. The Santa Barbara Trust for Historic Preservation presents the Asian American Neighborhood Festival, an outdoor event celebrating Asian American heritage at El Presidio de Santa Barbara State Historic Park. This free, family-friendly event celebrates the history and culture of the Asian communities that once thrived in and around the Santa Barbara Presidio. Learn about a number of Asian cultures through performances, food, and hands-on activities. Performances and artistic displays will celebrate the rich and vibrant traditions of our Asian American community. Traditional cultural performances feature dance, drumming, music, and other performing arts. Free parking in lot at the corner of Santa Barbara and Canon Perdido Streets behind Panino at 834 Santa Barbara Street. Please think about bringing one of your trees for our display. We always get a nice response from visitors. Contact Joe Olson, joeyuccaseed@verizon.net, for more information.